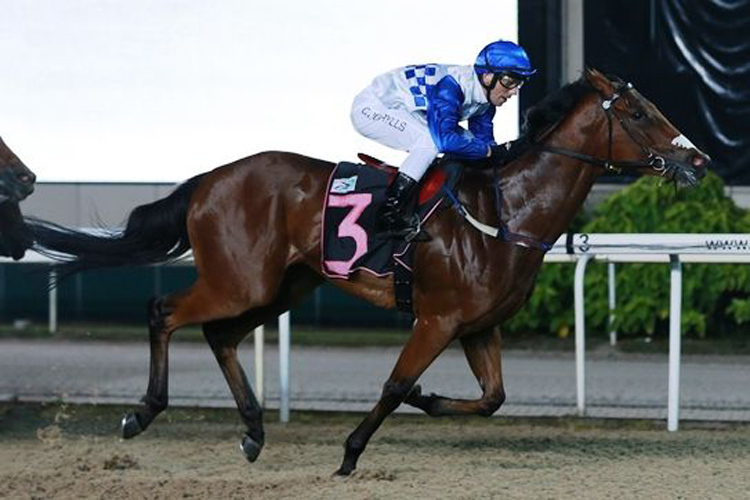 Elite Power looks well placed once again when he lines up in the Kranji Stakes C (1000m) on the polytrack tonight. Scoring a handy win over this C/D three starts back, the Mark Walker-trained runner has gone on to place in two runs since and was not too far away from Special King when runner up in a Kranji Stakes C last start over 5 1⁄2 f.
Elite Power has failed just once in six starts since coming to Singapore when he bled earlier in the year and his sprinting form in the UK was strong. From barrier 3, the four-year-old gelding is likely to settle just off the speed and based on his last few efforts he will be getting to the line strongly with the addition on the blinkers and pacifiers. Elite Power rates well against his rivals today on best form and also proven in this sort of company this looks a very nice race for him. My Horse also comes off some consistent sprinting form and shapes up as the main danger today. Winning a Class 3 over this C/D three starts back, My Horse has been far from disgraced in two runs since and certainly has shown enough to suggest he is up to winning this. From barrier six, Nooresh Juglall will push forward to lead once again today and like always give them something to run down. My Horse seemingly ran out of puff his last two outings and you would expect the tempo to be strong again today over the 5 f trip. If he can get an easier time of things up front then there is not doubt he could hang on and get the win against these. The lightly raced Augustano returns in this, last seen when fourth in the Group 3 Singapore Sprint last campaign. Won a Class 3 over 5 1⁄2 f on the polytrack prior to that effort and should be ready to fire today on the back of a barrier trial win over 5 f.
This will be his first outing over the 5 f trip but he has won over 5 1⁄2 f previously and generally produces a strong effort when fresh as well. Likely to be prominent from barrier eight and I would be very surprised if he is not somewhere in the mix over the concluding stages. Yulong Fast Steed who also returns rounds out the main chances producing some decent form last campaign. His only win since coming to Singapore came over this C/D and third in a recent barrier trial behind Rafaello should have him ready to produce a solid effort today.